On Friday, March 22, 2019, at Wanda Metropolitano stadium in Madrid, Spainruns there was an international friendly football match between Argentina and Venezuela with the participation of Argentina’s soccer player Lionel Messi. After the match, Argentina star Lionel Messi admitted that constant criticism from domestic fans made him upset, adding that even his 6-year-old son asked him why his home fans protest against his performances for the national team. Messi was thought not to have the same enthusiasm for national football in comparison with what he does for his club Barcelona. His fans also raised questions for his silence after being eliminated from last year’s World Cup by France, something Messi said he really wanted to forget. Messi talked to radio Club 94.7 that he wanted to distance himself from the team, let time go by and cool himself. He feels painful for ending the cycle by this way. People said that he should not return to the national team (Argentina). But 31-year-old national team captain stated that he still wanted to win a tournament and will lead his team to victory under coach Lionel Scaloni. 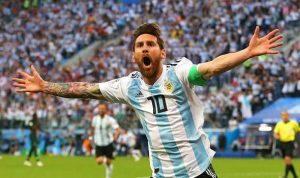 He said that although some people do not like him they have to bear hin a little longer, adding that he had obtained “extraordinary things” with Argentina, including one World Cup final and two Copa America finals and they are very difficult to achieve. People said that Messi pick the coaches and the players for Argentina but he denied. He emphasized that it is not a “club of friends” and he could not manage Argentina’s football association. Messi pointed out that average Argentinians always show kindness to him whenever he visits the South American country. The striker emphasized that due to severe injury he was absent in a friendly football debut in Tangier on Tuesday when Argentina defeated Morocco one to nil. Before that victory, Argentina lost 3-1 to Venezuela in Madrid in a friendly match imprinted the return of Messi. Scaloni said after this event Messi will for sure play in this year’s Copa America, happened from June 14 to July 7 in Brazil.